One would think that a relatively new character like Rocket Raccoon there would be a definitive answer on where he first appeared. In truth there is a massive controversy swirling on where he actually first appeared. I have seen borderline fist fights over this issue in comic book stores and comic cons. There is an intense disagreement amongst the Marvel Aficionados as to what actually counts as Rocket's first appearance. Scrolling the web on multiple sites you will find different answers. Some people say he appeared in Marvel Preview #7 others say in Incredible Hulk #271 why the controversy? So Marvel Preview was definitely printed first. Unfortunately there are problems with Marvel Preview #7 that cause a slew of questions. The first problem is that Marvel Preview #7 is not a comic book it is a black and white magazine and its stories where not always considered to be in continuity of the main Marvel Universe. 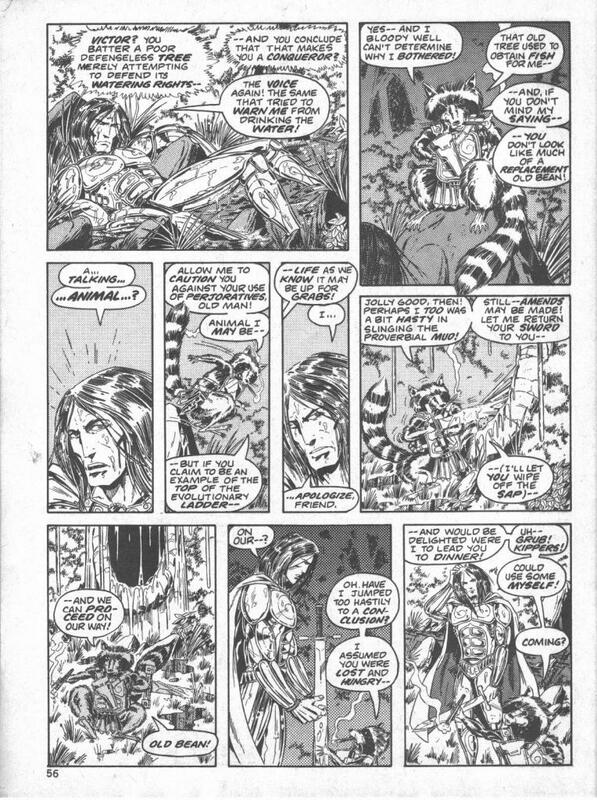 Some people argue that appearances in the magazine do not count as the first appearance of the character in the Marvel Universe. The magazines were more like ad promos and not really Marvel canon. Given the fact that Marvel Preview #7 is not a comic we can say definitely that the first comic appearance of Rocket Raccoon is Hulk #271. Hulk #271 supporters take this one step farther and say that Rocket Raccoon never appeared in Marvel Preview #7 at all. The character in Marvel Preview #7 is a separate talking Raccoon character who lives 10 thousand years in the future and calls himself Rocky. He does not have a giant gun, he does not mention halfworld or his girl friend Lyla, he also talks in a medieval antediluvian dialect unlike the Rocket Raccoon we see in other Marvel Stories. The costume of the character also looks more fantasy based than the pure sci fi Raccoon we see in the rest of the stories. When you look at this Rocky character you see a character that clearly resembles Rocket Raccoon but is not Rocket Raccoon. The setting is that he is in a fantasy scifi hybrid story called Sword and Star kind of like a Prince Valiant story 10 thousand years in the future. Sword and Star and the main character prince are not considered canon anymore at Marvel. 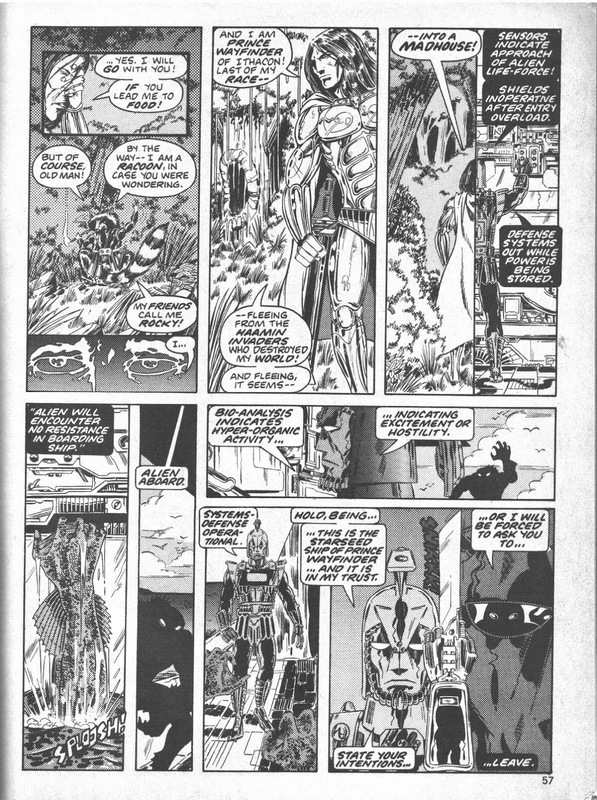 Prince Wayfair was considered to be the creator of the Microverse which was critical to the Micronauts a comic tie in to a set of toys in the 80s. The Micronauts rights are no longer owned by Marvel though, they sold them to Hasbro. People who claim Marvel Preview #7 is the first appearance point out that there are not many talking raccoons in comics period, and that both Rocky and Rocket were created by the same creator Bill Mantlo. Also and this is a big one in favor of Marvel Preview #7 Walrun calls Rocket by both the name Rocky and Rocket in Hulk #271. Hulk #271 supporters would counter that Rocket could never end up 10 thousand years in the future with a guy not in Marvel canon, talk entirely differently, not mention his home planet, and totally alter his costume. Plus not sport a giant gun or otherwise act or resemble like Rocket other than being a talking raccoon. To me when you look at Marvel Preview #7 you don't see Rocket Raccoon you see a character precursor to Rocket Raccoon. There is just something intrinsically not right about the character that appears in Marvel Preview #7. 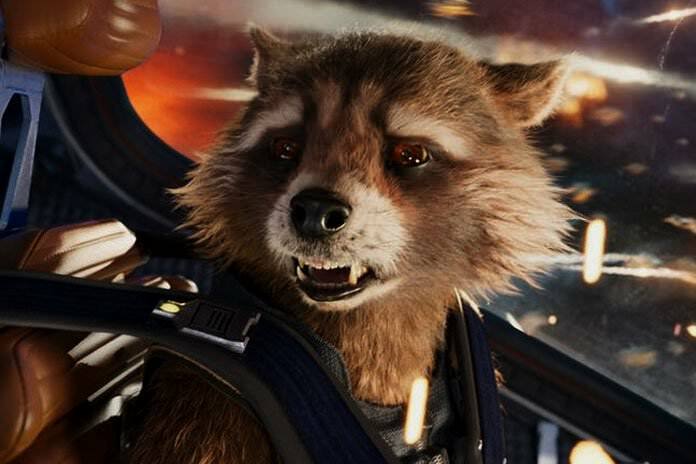 Bill Mantlo was working toward the idea of Rocket Raccoon but he is not there yet. The Rocket in the story appears more like a medieval character and fantasy story. He speaks different and appears to have an entirely different origin than the Rocket Raccoon that exists on Halfworld. He does not mention his friends on Halfworld, or Halfworld at all. The Rocky Raccoon exists 10 thousand years in the future dealing with a character that I'm not sure Marvel even has the rights to now. It is obvious that Bill is working toward Rocket Raccoon but does he get all the way there in Marvel Preview #7? In my eyes he does not. Imagine there was a story prior to the accepted first appearance of Spider-Man where a character in a swashbuckling pirate ship on a planet of Bisbanai, has the powers of Spider-Man and calls himself Petey Parky. He wears a mask like Spider-Man but talks in a pirate accent. Would you accept this as the first appearance of Spider-Man? I would not accept this at all. Amazing Fantasy #15 the actual first appearance of Spider-Man contains nearly the exact character of Spider-Man as we know him today. He is from the same place, with the same powers, the same name, the same origins as the Spider-Man series that comes after him. This is not at all the case with Marvel Preview #7 and Rocky the Raccoon. This is why I see Rocky the Raccoon character in Marvel Preview #7 as a pure character precursor to Rocket Raccoon. In Hulk #271 by contrast the Rocket Raccoon is almost entirely fleshed out as the Rocket Raccoon we know today and appears again in Bill Mantlo's Rocket Raccoon Solo series. It is very similar to George Lucas's early drafts of Star Wars that showed a character called Annikin Starkiller. Annakin Starkiller had qualities of Luke Skywalker, Darth Vader and Han Solo. Eventually, in later drafts he was rewritten into the other main characters. If you had a book with Annakin Starkiller in it, you would not claim to have the first appearance of Han Solo or Luke Skywalker. To me Marvel Preview #7 is CLEARLY the first appearance of Rocky the Raccoon a character that is a precursor to Rocket Raccoon much like Annakin Starkiller. Hulk #271 is the first appearance of Rocket Raccoon in print and comic form. Marvel Preview #7 is the first appearance of Rocky Raccoon the precursor to Rocket Raccoon. Both are very cool, both are part of comic history and both should be worth a lot! Look at the panels of Rocky Raccoon in Marvel Preview #7 and Hulk #271 what do you think? The black and white images are from Marvel Preview and the colored ones are from Hulk 271. Toylab has a freaking TON of Guardians of the Galaxy content related to reviews, the comics, art and cosplay check it all out at in the link below! Who is Daisy Johnson / Quake /Skye? Is this the end of Rick Grimes? Gorochu - A mysterious Evolution of Pikachu? Pokemon Go - How do you beat Exeggutor? Who can lift Thor's Hammer and Why? Is Glenn Talbot an Inhuman? Cloak and Dagger new trailer!